Next postTwo more young people dead; victims of a broken system? Both you and the journalist can be proud of the article. Well done to both of you! Leonie you really are one in a million. 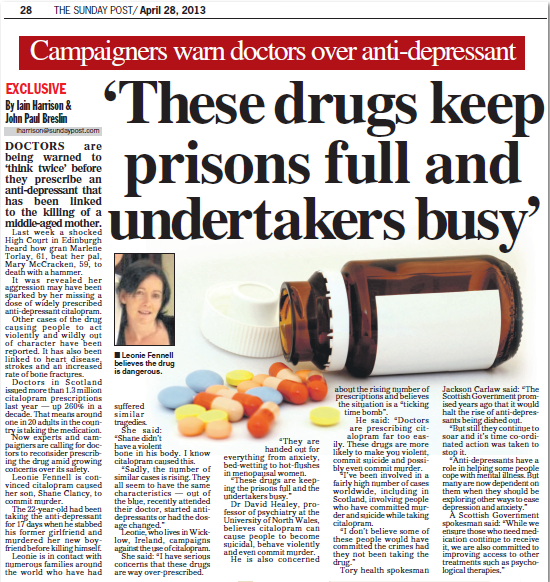 I look forward to the day when all of of us who have suffered as a consequence of ill thought prescribing practices will get the justice and recognition we deserve. In the meantime, your tireless efforts are the best tribute there is to your son’s life. I’m really glad that both sides of the debate are being heard, it’s important that people understand how strong anti-depressants are, and how badly they can affect some people. However, for others they can be helpful. In 2011 I had a depression relapse after a decade with no problems. 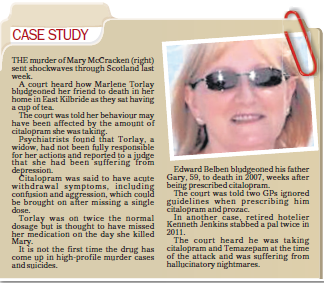 I was reluctant to take Citalopram, I was prescribed it as a teenager and it was the one and only time I’ve ever attempted to take my own life. It terrified me, and I had a bullying GP who tried to force me into compliance with threats of sectioning, which only made me more scared of asking for help. Depression and anxiety were ruining my life, I lost my job, partner, and a lot of friends. After everything else had failed, I added anti-depressants to my care package. For me it was the last puzzle piece on the road to recovery. Along with CBT, mindfulness, rest, relaxation, love from family and friends, and an amazing GP who monitored me closely, Citalopram helped me get back on my feet and begin to recover from depression. It has a lot of unpleasant side effects, I’ve been taking it for longer than I wanted to, and I know the withdrawal will be long and painful, but it is helpful for me. So please, if you’re reading this, look at both sides of the argument, then make your own choice based on what you need. Thanks for all the comments, much appreciated. On the issue of whether SSRIs work or not, let me clear that one up. As I have always said, if the drug works for you, that’s great, then there is no problem. If a person is already on Citalopram and it’s not causing a problem, great… just watch out for the heart problems, diabetes, etc. The sad fact is, this blog is about my son’s experience with this drug. If anyone wants to play Russian Roulette, free free. If you choose to offer up your own child for a bit of auld collateral damage, I can’t stop you. I did not offer Shane up to die so others can live…the stakes were way too high. He wasn’t given the option of Informed consent. On the issue of my dodgy fringe Bobby Fiddaman, sad to say that this is one of the better photos; I usually look much worse! PS. Jennifer, that’s a really interesting site. The old advertisements are great and I have just downloaded the DSM 4! Thank you Leonie. I will get this around in the U.S.
Well done for all your work making people aware of this.